First decide how many beers you want to serve and what the overall goal of the event is. Do you want to touch on many different styles or stick to a few? Figure about 20-30 minutes at each station, if not longer, so you can truly enjoy the food and the beer together without being rushed. People will want to share their thoughts about the beers and whatever other conversation breaks out. I believe that it is very important to provide some basic tasting notes so that those who aren’t familiar with any of the beers have a source of information. The order of the beers is very important. 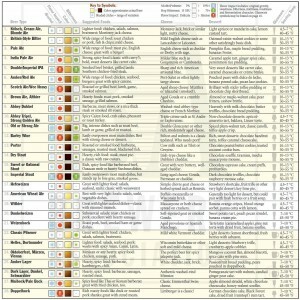 Generally, you want to start lighter & milder and then build up to the big boys (stouts and barleywines) at the end. Definitely don’t kill people’s taste buds early. Food should be served that enhances the enjoyment of the beers that it is paired with. 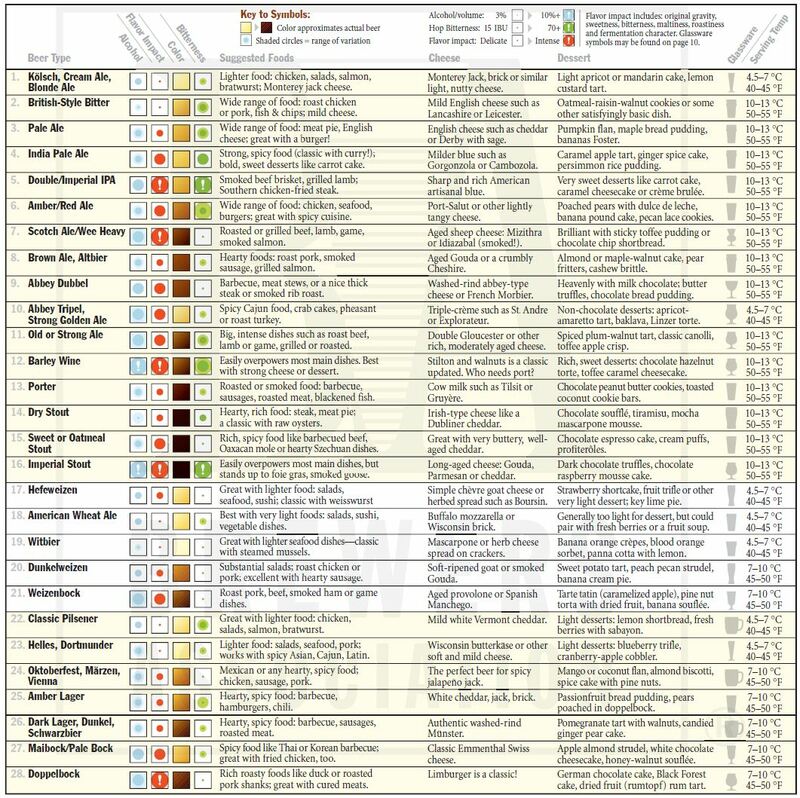 Examine the flavor and aroma profile of each of the beers when selecting a menu. Keep people moving! If possible move people to different locations for each of the pairings. Doing so keeps the emphasis on the event itself rather than the setup & cleanup between each pairing. To successfully pull this off you will need a person providing the “back-end” coverage to do the leg work. That person can also participate at each pairing but will have to drop out and finish the final setup at the next pairing to ensure everything is ready. 1. Weihenstephan Hefe Weissbier paired with Marinated Lemon Shrimp and Variety of Goat Cheese and Mini Toasts. Wow, the host came out swinging with a lemony hefe beer paired with large marinated shrimp. I parked myself next to the shrimp because the beer worked perfectly with the shrimp. As a group this station was a big hit and our conversation drifted away from beer. We must’ve spent 30-40 minutes at this station but it was time well-spent. 3. Rogue Chipotle Ale paired with House Chili and IPA Cashew Cream Sauce. To Truly enjoy the effects that a proper food pairing can have with a beer you must sometimes try the beer first. I had never had the Chipotle Ale before so I tried it first. It wasn’t too spicy but I did get a good taste of the chili peppers. However, I didn’t get the smokiness that normally comes with a chipotle pepper. Next, I had the ale with the chili. The chili was perfectly balanced between spicy and mild for all tastes and perfectly balanced with the ale. Even those that didn’t like the Chipotle Ale by itself was pleasntly surprised. 4. Trappists Rochefort 10 Ale paired with Brie-Gruyere Mac and Cheese. Rocherfort 10 is a classic beer. It’s creamy heaviness and tart & sweet aftertaste held up well with the creaminess of the Mac and Cheese. I was worried that the weight of this stop would weigh me down but the time between stations really helped. 5. DuClaw Retribution Bourbon Aged Imperial Stout paired with Roasted Barbecue Ribs and Stout Sriracha Sauce. Now onto the big boys of the evening. First up was the Retribution. The beer itself is has a silky smoothness so that the aroma and taste of the bourbon-barrel aging slides easily past the nose and has a lasting mouthfeel. The ribs were cooked perfectly as attested by the “rib-head” that was in attendance. Here the discussion branched off to discuss the pros and cons of various rib and barbecue joints in the area. 6. Southern Tier Imperial Choklat Stout paired with choice of Chocolate Bourbon Pecan Pie Bars or Chocolate Pound Cake with Chocolate Stout Fudge Icing. Woof. I LOVED this station. The Choklat Stout and the Pecan Pie Bars & Pound Cake lead to extreme chocolate overload. This pairing was a perfect way to end the evening. The beer and food were both very heavy. The bitter sweetness of the chocolate shone through. I immensely enjoyed this beer and food paring. Why was it successful?The beers were top notch and varied so that everyone’s tastes were included. The host provided great tasting notes and took the time to prepare an accompanying food that worked very well with each of the beers. My favorites were the Hefe/Shrimp and Choklat Stout/dessert pairings. We moved locations so that the emphasis stayed on the beer and food. But, most importantly, we all enjoyed getting together to enjoy and talk about beer and then whatever else came up. Last updated by Bob Pack at February 21, 2013 .